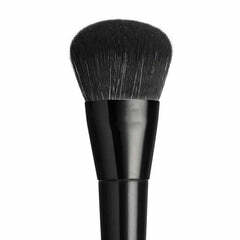 This elegant professional makeup brush set is specifically designed for pro makeup artists. It features all the brushes you need for any job, and contains 20 of the highest quality reliable brushes, helping you work smoothly and deliver premium results. If you are a makeup student, this set will take you from classroom practice to on-set performances in a heartbeat. The soft vegan brush case doubles as a brush belt, saving you time packing and setting up, and offers plenty of room for additional brushes. Each brush in the set is expertly handmade with the finest of materials, with vegan friendly bristles, of course! Open - 38.5 wide, 33cm high. Closed - 19.25 wide, 33cm high.